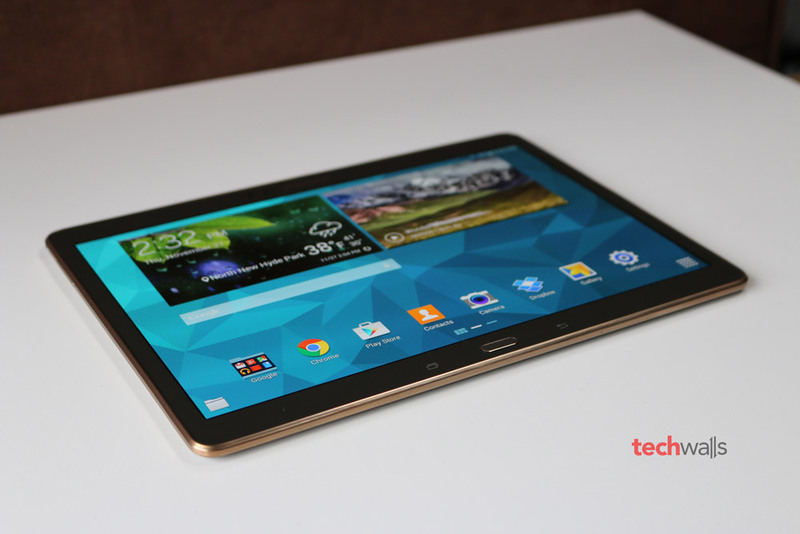 Samsung Galaxy Tab S 10.5 Review - Who Should Buy the Tablet? 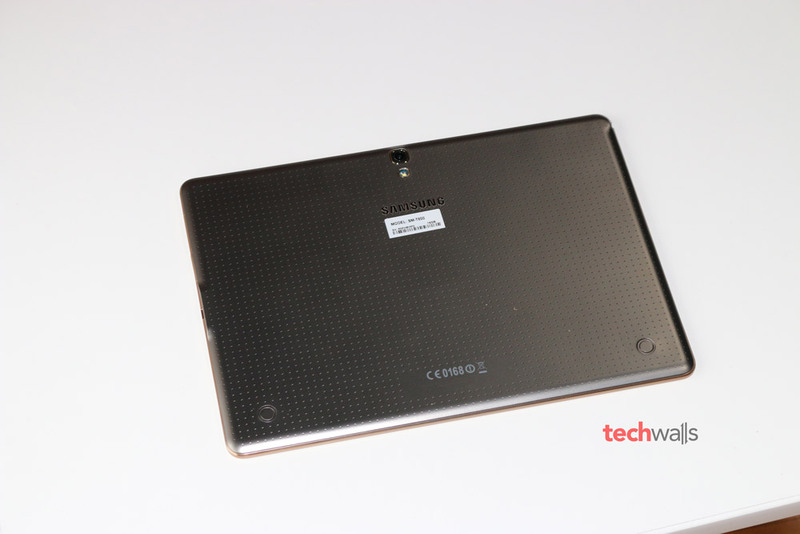 Samsung Galaxy Tab S 10.5 Review – Who Should Buy the Tablet? 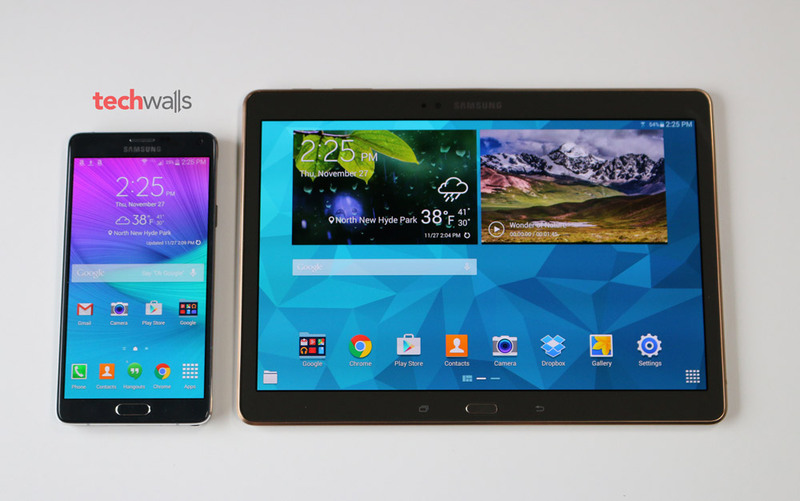 Earlier this year, Samsung released two premium tablets which are Samsung Galaxy Tab S 8.4 and Tab S 10.5. 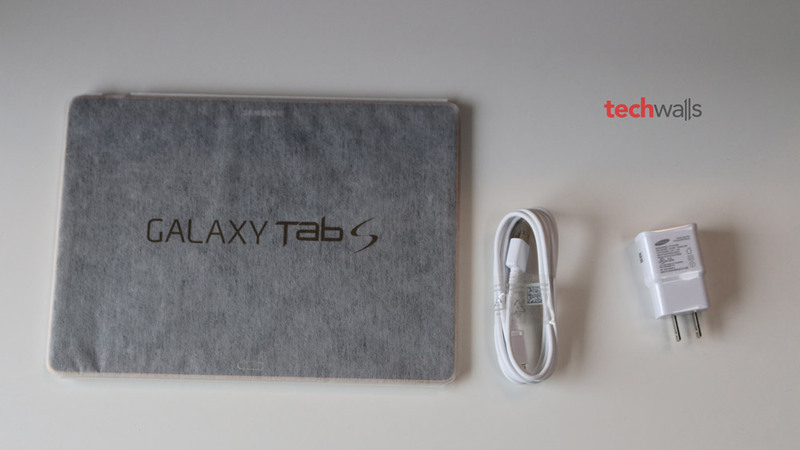 In this review, we are going to check out the Galaxy Tab S 10.5 and see if it is a good upgrade. There is nothing special about the design of Galaxy Tab S. It has the tablet, a USB cable and power adapter out of the box. The tablet itself looks similar to other Galaxy devices as it still has the plastic construction. The Tab S comes in 2 colors, which are White and Bronze. The review unit is the Bronze version. As you can see, it has the familiar dimpled back panel and there are two proprietary buttons which are used to snap Samsung’s proprietary cases on. The back case is not removable but you can easily insert a microSD card on the side. The design might not be as sleek as iPad Air 2 or Nexus 9, but it is so thin and lightweight. Although the screen size is bigger, its weight and dimensions are very impressive, specifically, its weight is 16.40 oz and dimensions are 6.98″ x 9.74″ x 0.26″. The Tab S is powered by the Exynos 5 Octa CPU (1.9Ghz Quadcore + 1.3 Ghz Quadcore), 3GB of RAM and runs on TouchWiz UI on top of Android 4.4 KitKat. The performance is great for most tasks, we are just not sure when the device will be upgrade to Android 5.0 Lollipop. While the software experience is the same as other tablets, there are two useful features that I use frequently. The first one is Multi-window which facilitate multitasking by supporting screen split. 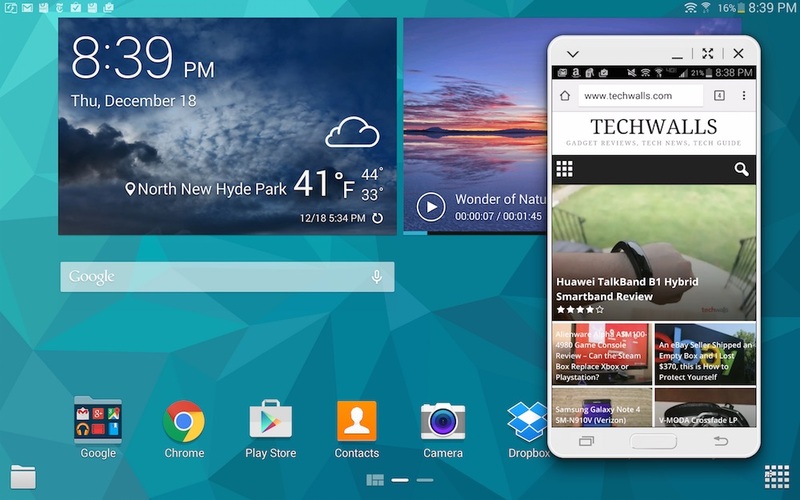 And the second one is SideSync 3.0 app, I connected the Tab S to my Galaxy Note 4 and it works perfectly. I was able to make/receive phone calls without touching my phone. As the phone’s screen is now mirrored to the tablet, I can take control of the phone anytime right on the tablet. There is a little delay but it is totally acceptable. This must be the selling point of the Tab S. The tablet has two small speakers located on two sides but it is loud enough to deliver sound in my apartment. And the strongest point of the tablet is of course the display. It features a 10.5-inch Super AMOLED display with the resolution of 2560 x 1600 pixels. 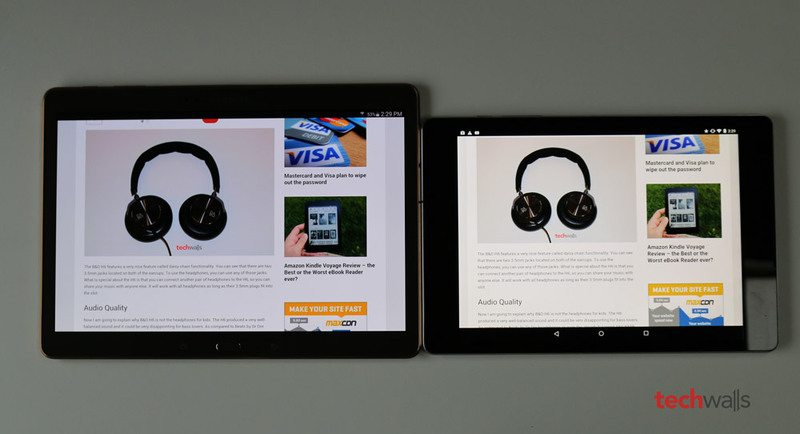 The screen is super vibrant and when I place it alongside the Nexus 9, I can easily see the huge difference. While the Nexus 9’s screen is a little pale, the Tab S delivers rich colors and sometimes oversaturated green and red. The screen might be too colorful and unnatural but undoubtedly it looks so appealing. Therefore, you might hate or love it, depending on your taste. I’m a little disappointed with battery life of the tablet. For light uses, it can last 3-4 days while for more intensive uses, the battery could endure just till the end of 2nd day. Besides, charging the battery life takes very long, I often have to wait around 4 hours for a full charge. Some useful features and apps. The Samsung Galaxy Tab S 10.5 is available on Amazon for around $400. This is a very well-built tablet but it couldn’t stand out in the saturated market. I will recommend it only if you haven’t got a big tablet yet, it is not worth upgrading if you have already had a decent one.